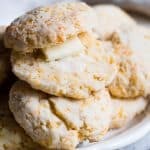 These Cheddar Gluten Free Biscuits With Buttermilk are SO flaky, soft and buttery that you won't believe how easy they are! The BEST gluten free biscuits! In a large bowl, stir together the cornstarch, oat flour, rice flour, baking powder, salt and xantham gum. Once mixed, stir in the cheese until well incorporated. Add in the butter cubes and either use a pastry blender, or your hands, to cut it into the flour mixture until you have only small pea-sized pieces of butter. Add in the buttermilk and stir until it starts to come together. Then use your hands to knead the dough in the bowl, until it just starts to come together about 1-2 minutes (I find it easiest to use SLIGHTLY damp hands) Don't over-knead. The dough will be soft and sticky. Drop by heaping 2 Tbsp balls onto the prepared pan and press out about 3/4 inch thick. Bake until the outsides are crusty and some of the cheese starts to brown, about 17-18 minutes. ** Biscuits are best served fresh from the oven.